This article is about Chicago Landmarks designated by the city government. For National Register places in Chicago, see National Register of Historic Places listings in Chicago. Glessner House, designated on October 14, 1970, was one of the first official Chicago Landmarks. Its unique location or distinctive physical appearance or presence representing an established and familiar visual feature of a neighborhood, community, or the City of Chicago. Once the commission has determined that a candidate meets at least two of the above criteria, the group may provide a preliminary landmark designation if the candidate "has a significant historic, community, architectural or aesthetic interest or value, the integrity of which is preserved in light of its location, design, setting, materials, workmanship, and ability to express such historic, community, architectural or aesthetic interest or value." the real estate boom in response to the demand for increased office space in the Loop. In 1957, Chicago City Council 5th ward Alderman Leon Despres began the landmark preservation movement in Chicago, by adopting the Frank Lloyd Wright Robie House. This led to the formation of the City Landmarks Commission, who chose 39 buildings as "honorary" landmarks. That body evolved into the present Commission on Chicago Landmarks which was empowered by Despres's 1968 city ordinance to select and protect 12 important buildings as the inaugural official Chicago Landmarks. Although the movement was unable to save either Louis Sullivan's Garrick Theater in 1960 or Sullivan's Chicago Stock Exchange Building in 1972, the efforts spawned the Landmarks Preservation Council of Illinois in addition to the municipal Commission. Many landmarks have been designated with National Historic Landmark status by the United States Secretary of the Interior for historical significance. All of those and a number of other districts, sites, buildings, structures, and objects worthy of preservation have been listed on the National Register of Historic Places. Not all Chicago Landmarks have been listed on the National Register, and not all Registered Historic Places (not even all of those that are further designated National Historic Landmarks) have been designated Chicago Landmarks. No Chicago Landmarks are classified as any other type of National Park System protected area including National Parks, National Monuments, or National Preserves. The charts below detail these designations for the city of Chicago-designated sites and the National Historic Landmarks. For consistency, the list below uses the name from the Chicago Landmark website. Neighborhood names and boundaries are consistent with the Community areas in Chicago. Chicago & Illinois Western Railway Bridge December 12, 2007 1914 33rd Street and East of Kedzie Avenue, Slip of the Chicago Sanitary and Ship Canal. ^ "Designation Process". Commission on Chicago Landmarks. Archived from the original on January 15, 2011. Retrieved December 12, 2013. ^ "General Information". Commission on Chicago Landmarks. Retrieved December 12, 2013. ^ "Municipal Code of Chicago, IL: 2-120-620 Landmarks--Criteria for designation". American Legal Publishing Corporation. 2013. Retrieved December 12, 2013. ^ "Municipal Code of Chicago, IL: 2-120-630 Landmarks--Preliminary recommendation". American Legal Publishing Corporation. 2013. Retrieved December 12, 2013. ^ a b c d Sciacchitano, Barbara (2005). "Historic Preservation". Electronic Encyclopedia of Chicago. Chicago Historical Society. Retrieved April 14, 2007. ^ a b c d "First Annual Preservation Award to Marian and Leon Despres in February, 2005". Hyde Park Historical Society. Archived from the original on February 9, 2004. Retrieved April 13, 2007. ^ Wilogren, Jodi (May 31, 2005). "Age 97, and Still at War With the Old Daley Machine". The New York Times. Retrieved April 13, 2007. ^ a b c d "Chicago Landmarks: Alphabetical Listing". Chicago Dept. of Housing and Economic Dev., Historic Preservation Div. 2013. Retrieved December 12, 2013. ^ a b c d e f g h i j k l m n "National Register of Historic Places: Illinois – Cook County". National Register of Historic Places.com. Retrieved May 2, 2007. ^ a b "National Historic Landmarks Program". National Park Service. Retrieved December 12, 2013. ^ a b "National Historic Landmarks Survey: Listing of National Historic Landmarks by State: Illinois" (PDF). National Park Service. June 2013. Archived from the original (PDF) on November 17, 2011. Retrieved December 12, 2013. ^ "landmark Designation Report" (PDF). Chicago Dep. of Housing and Economic Development, Landmarks Div. 2013. Retrieved September 26, 2013. ^ a b c "Commission on Chicago Landmarks Certified Local Government Annual Report for 2014" (PDF). Chicago Dep. of Pl. and Dev., Landmarks Div. 2014. Retrieved August 8, 2017. ^ "Auditorium Building". National Park Service. 2004. Archived from the original on October 9, 2012. Retrieved April 16, 2007. ^ "Lincoln Park Lily Pool". National Park Service. Archived from the original on January 3, 2008. Retrieved April 16, 2007. ^ "Carson, Pirie, Scott, and Company Store". National Park Service. Archived from the original on March 5, 2008. Retrieved April 16, 2007. ^ "Charnley, James, House". National Park Service. 2004. Archived from the original on January 3, 2008. Retrieved April 16, 2007. ^ "Chicago Board of Trade Building". National Park Service. Archived from the original on December 7, 2007. Retrieved April 12, 2007. ^ a b c d e f g h i j "Commission on Chicago Landmarks Certified Local Government Annual Report for 2016" (PDF). Chicago Dep. of Pl. and Dev., Landmarks Div. 2016. Retrieved August 1, 2017. ^ "Commission on Chicago Landmarks Certified Local Government Annual Report for 2012" (PDF). Chicago Dep. of Pl. and Dev., Landmarks Div. 2012. Retrieved August 2, 2017. ^ "S.R. Crown Hall". National Park Service. Archived from the original on June 5, 2011. Retrieved April 16, 2007. ^ a b c d "Landmark Designation Report" (PDF). Chicago Department of Housing and Economic Development. 2013. Retrieved September 26, 2013. ^ a b "Commission on Chicago Landmarks Certified Local Government Annual Report for 2016" (PDF). Chicago Dep. of Pl. and Dev., Landmarks Div. 2015. Retrieved August 3, 2017. ^ "Glessner, John J., House". National Park Service. Archived from the original on January 3, 2008. Retrieved April 16, 2007. ^ "Heller, Isidore H., House". National Park Service. Archived from the original on January 3, 2008. Retrieved April 16, 2007. ^ "Hull House". National Park Service. Archived from the original on November 14, 2007. Retrieved April 12, 2007. ^ "Leiter II Building". National Park Service. Archived from the original on January 3, 2008. Retrieved April 16, 2007. ^ "Marquette Building". National Park Service. Archived from the original on January 3, 2008. Retrieved April 12, 2007. ^ "Marshall Field Company Store". National Historic Landmark program. National Park Service. Archived from the original on March 3, 2008. Retrieved March 1, 2008. ^ "Montgomery Ward Company Complex". National Park Service. Archived from the original on January 3, 2008. Retrieved April 16, 2007. ^ "Site of the First Self-Sustaining Nuclear Reaction". National Park Service. Archived from the original on April 5, 2015. Retrieved April 16, 2007. ^ "Page Brothers Building". Chicago Dep. of Pl. and Dev., Landmarks Div. 2003. Archived from the original on June 13, 2008. Retrieved April 13, 2007. ^ "Palliser's Cottage Home No. 35". Chicago Dep. of Pl. and Dev., Landmarks Div. 2003. Archived from the original on July 15, 2012. Retrieved April 13, 2007. ^ "Palmer House Hotel". Chicago Dep. of Pl. and Dev., Landmarks Div. 2006. Archived from the original on July 17, 2012. Retrieved April 13, 2007. ^ "Palmolive Building". Chicago Dep. of Pl. and Dev., Landmarks Div. 2003. Archived from the original on July 17, 2012. Retrieved April 13, 2007. ^ "Pate-Comiskey House". Chicago Dep. of Pl. and Dev., Landmarks Div. 2003. Archived from the original on July 20, 2012. Retrieved April 13, 2007. ^ "Peoples Gas Irving Park Neighborhood Store". Chicago Dep. of Pl. and Dev., Landmarks Div. 2003. Archived from the original on July 28, 2012. Retrieved April 13, 2007. ^ "Peoples Gas South Chicago Neighborhood Store". Chicago Dep. of Pl. and Dev., Landmarks Div. 2003. Archived from the original on June 13, 2008. Retrieved April 13, 2007. ^ "Perkins, Fellows & Hamilton Office and Studio". Chicago Dep. of Pl. and Dev., Landmarks Div. 2003. Archived from the original on June 13, 2008. Retrieved April 13, 2007. ^ "Henry V. Peters House". Chicago Dep. of Pl. and Dev., Landmarks Div. 2003. Archived from the original on June 13, 2008. Retrieved April 13, 2007. ^ "Wendell Phillips High School". Chicago Dep. of Pl. and Dev., Landmarks Div. 2003. Archived from the original on June 13, 2008. Retrieved April 13, 2007. ^ "Pilgrim Baptist Church". Chicago Dep. of Pl. and Dev., Landmarks Div. 2003. Archived from the original on July 17, 2012. Retrieved April 13, 2007. ^ "Pittsfield Building". Chicago Dep. of Pl. and Dev., Landmarks Div. 2003. Archived from the original on June 13, 2008. Retrieved April 13, 2007. ^ "Landmarks Designation Report" (PDF). Chicago Department of Housing and Economic Development. 2013. Retrieved September 26, 2013. ^ "Powhatan Apartments". Chicago Dep. of Pl. and Dev., Landmarks Div. 2003. Archived from the original on July 16, 2012. Retrieved April 13, 2007. ^ "Prairie Avenue District". Chicago Dep. of Pl. and Dev., Landmarks Div. 2003. Archived from the original on June 13, 2008. Retrieved April 13, 2007. ^ "South Dearborn Street-Printing House Row North Historic District". National Park Service. Archived from the original on October 10, 2012. Retrieved April 16, 2007. ^ "Pulaski Park Fieldhouse". Chicago Dep. of Pl. and Dev., Landmarks Div. 2003. Archived from the original on February 12, 2010. Retrieved April 13, 2007. ^ "Pullman District". Chicago Dep. of Pl. and Dev., Landmarks Div. 2003. Archived from the original on July 18, 2012. Retrieved April 13, 2007. ^ "Pullman Historic District". National Park Service. Archived from the original on June 5, 2011. Retrieved April 16, 2007. ^ "Quinn Chapel". Chicago Dep. of Pl. and Dev., Landmarks Div. 2003. Archived from the original on June 13, 2008. Retrieved April 13, 2007. ^ "Raber House". Chicago Dep. of Pl. and Dev., Landmarks Div. 2003. Archived from the original on June 13, 2008. Retrieved April 13, 2007. ^ "Race House". Chicago Dep. of Pl. and Dev., Landmarks Div. 2003. Archived from the original on June 13, 2008. Retrieved April 13, 2007. ^ "Rath House". Chicago Dep. of Pl. and Dev., Landmarks Div. 2003. Archived from the original on July 18, 2012. Retrieved April 13, 2007. ^ "Reebie Storage Warehouse". Chicago Dep. of Pl. and Dev., Landmarks Div. 2003. Archived from the original on June 13, 2008. Retrieved April 13, 2007. ^ "Harriet F. Rees House". Chicago Dep. of Pl. and Dev., Landmarks Div. Retrieved November 29, 2013. ^ "Reid, Murdoch & Co. Building". Chicago Dep. of Pl. and Dev., Landmarks Div. 2003. Archived from the original on July 15, 2012. Retrieved April 13, 2007. ^ "Reliance Building". Chicago Dep. of Pl. and Dev., Landmarks Div. 2003. Archived from the original on July 29, 2012. Retrieved April 13, 2007. ^ "Reliance Building". National Park Service. Retrieved April 16, 2007. ^ "Roberts Temple Church of God in Christ Building". Chicago Dep. of Pl. and Dev., Landmarks Div. 2006. Archived from the original on July 17, 2012. Retrieved April 13, 2007. ^ "Robie House". Chicago Dep. of Pl. and Dev., Landmarks Div. 2003. Archived from the original on June 13, 2008. Retrieved April 13, 2007. ^ "Robie, Frederick C., House". National Park Service. Archived from the original on October 10, 2012. Retrieved April 16, 2007. ^ "Rockefeller Memorial Chapel". Chicago Dep. of Pl. and Dev., Landmarks Div. 2004. Archived from the original on July 16, 2012. Retrieved April 13, 2007. ^ "Roloson Houses". Chicago Dep. of Pl. and Dev., Landmarks Div. 2003. Archived from the original on July 16, 2012. Retrieved April 13, 2007. ^ "Rookery Building". Chicago Dep. of Pl. and Dev., Landmarks Div. 2003. Archived from the original on June 13, 2008. Retrieved April 13, 2007. ^ "Rookery Building". National Park Service. Archived from the original on June 5, 2011. Retrieved April 16, 2007. ^ "Rosehill Cemetery Entrance". Chicago Dep. of Pl. and Dev., Landmarks Div. 2003. Archived from the original on July 17, 2012. Retrieved April 13, 2007. ^ "Site of the Sauganash Hotel/Wigwam". Chicago Dep. of Pl. and Dev., Landmarks Div. 2003. Archived from the original on July 17, 2012. Retrieved April 11, 2007. ^ "Schlect House". Chicago Dep. of Pl. and Dev., Landmarks Div. 2003. Archived from the original on July 15, 2012. Retrieved April 13, 2007. ^ "landmark Designation Report" (PDF). Chicago Dep. of Housing and Economic Development, Landmarks Div. 2012. Retrieved September 26, 2013. ^ "F.R. Schock House". Chicago Dep. of Pl. and Dev., Landmarks Div. 2003. Archived from the original on July 20, 2012. Retrieved April 13, 2007. ^ "Marie Schock House". Chicago Dep. of Pl. and Dev., Landmarks Div. 2003. Archived from the original on June 13, 2008. Retrieved April 13, 2007. ^ "Schoenhofen Brewery". Chicago Dep. of Pl. and Dev., Landmarks Div. 2003. Archived from the original on June 13, 2008. Retrieved April 13, 2007. ^ "Schurz High School". Chicago Dep. of Pl. and Dev., Landmarks Div. 2003. Archived from the original on June 13, 2008. Retrieved April 13, 2007. ^ "Sears, Roebuck and Company Administration Building". Chicago Dep. of Pl. and Dev., Landmarks Div. 2003. Archived from the original on July 5, 2009. Retrieved April 13, 2007. ^ "Sears, Roebuck, And Company". National Park Service. Archived from the original on June 6, 2011. Retrieved April 16, 2007. ^ "Second Presbyterian Church". Chicago Dep. of Pl. and Dev., Landmarks Div. 2003. Archived from the original on July 17, 2012. Retrieved April 13, 2007. ^ "Seven Houses on Lake Shore Drive District". Chicago Dep. of Pl. and Dev., Landmarks Div. 2003. Archived from the original on September 18, 2012. Retrieved April 13, 2007. ^ "Sexton School". Chicago Dep. of Pl. and Dev., Landmarks Div. 2003. Archived from the original on July 16, 2012. Retrieved April 13, 2007. ^ "Shedd Park Fieldhouse". Chicago Dep. of Pl. and Dev., Landmarks Div. 2004. Archived from the original on June 13, 2008. Retrieved April 13, 2007. ^ "Council approves landmark status for Shoreland Hotel". Chicago Department of Zoning and Land Use Planning. 2010. Archived from the original on December 8, 2010. Retrieved September 21, 2010. ^ "Soldiers' Home". Chicago Dep. of Pl. and Dev., Landmarks Div. 2003. Archived from the original on July 16, 2012. Retrieved April 13, 2007. ^ "South Pond Refectory and Men's and Ladies' Comfort Station". Chicago Dep. of Pl. and Dev., Landmarks Div. 2003. Archived from the original on July 20, 2012. Retrieved April 13, 2007. ^ "South Side Cultural Center". Chicago Dep. of Pl. and Dev., Landmarks Div. 2004. Archived from the original on June 13, 2008. Retrieved April 13, 2007. ^ "Chicago Landmarks – South Side Community Art Center". City of Chicago. Retrieved December 25, 2010. ^ "Spiegel Administration Building". Commission on Chicago Landmarks. 2011. Retrieved December 12, 2013. ^ "St. Gelasius Church Building". Chicago Dep. of Pl. and Dev., Landmarks Div. 2004. Archived from the original on June 13, 2008. Retrieved April 13, 2007. ^ "St. Ignatius College Prep Building". Chicago Dep. of Pl. and Dev., Landmarks Div. 2003. Archived from the original on June 13, 2008. Retrieved April 13, 2007. ^ "Statue of The Republic". Chicago Dep. of Pl. and Dev., Landmarks Div. 2003. Archived from the original on July 17, 2012. Retrieved April 13, 2007. ^ "Landmark Designation Report" (PDF). Chicago Department of Housing and Economic Development. 2013. Retrieved September 26, 2013. ^ "Steuben Club Building". Chicago Dep. of Pl. and Dev., Landmarks Div. 2006. Archived from the original on June 13, 2008. Retrieved April 13, 2007. ^ "Sunset Cafe". Chicago Dep. of Pl. and Dev., Landmarks Div. 2003. Archived from the original on July 16, 2012. Retrieved April 13, 2007. ^ "Supreme Life Building". Chicago Dep. of Pl. and Dev., Landmarks Div. 2003. Archived from the original on June 13, 2008. Retrieved April 13, 2007. ^ "Surf-Pine Grove District". Chicago Dep. of Pl. and Dev., Landmarks Div. 2007. Archived from the original on July 15, 2012. Retrieved April 13, 2007. ^ "Lorado Taft's Midway Studios". Chicago Dep. of Pl. and Dev., Landmarks Div. 2003. Archived from the original on July 16, 2012. Retrieved April 13, 2007. ^ "Taft, Lorado, Midway Studios". National Park Service. Archived from the original on June 6, 2011. Retrieved April 15, 2007. ^ "Terra Cotta Row District". Chicago Dep. of Pl. and Dev., Landmarks Div. 2003. Archived from the original on July 17, 2012. Retrieved April 13, 2007. ^ "Thalia Hall". Chicago Dep. of Pl. and Dev., Landmarks Div. 2003. Retrieved December 13, 2012. ^ "Theurer-Wrigley House". Chicago Dep. of Pl. and Dev., Landmarks Div. 2003. Archived from the original on June 13, 2008. Retrieved April 13, 2007. ^ "Three Arts Club". Chicago Dep. of Pl. and Dev., Landmarks Div. 2003. Archived from the original on July 19, 2012. Retrieved April 13, 2007. ^ "Tree Studios, Annexes, and Courtyard". Chicago Dep. of Pl. and Dev., Landmarks Div. 2003. Archived from the original on June 13, 2008. Retrieved April 13, 2007. ^ "Tribune Tower". Chicago Dep. of Pl. and Dev., Landmarks Div. 2003. Archived from the original on June 13, 2008. Retrieved April 13, 2007. ^ "Truevine Missionary Baptist Church". Chicago Dep. of Pl. and Dev., Landmarks Div. 2003. Archived from the original on July 15, 2012. Retrieved April 13, 2007. ^ "Trustees System Service Building". Chicago Dep. of Pl. and Dev., Landmarks Div. 2003. Archived from the original on July 17, 2012. Retrieved April 13, 2007. ^ "Turzak House". Chicago Dep. of Pl. and Dev., Landmarks Div. 2003. Archived from the original on July 17, 2012. Retrieved April 13, 2007. ^ "Ukrainian Village District". Chicago Dep. of Pl. and Dev., Landmarks Div. 2003. Archived from the original on September 5, 2012. Retrieved April 13, 2007. ^ "Union Park Hotel". Chicago Commission on Landmarks. 2010. Retrieved December 13, 2013. ^ "Union Station". Chicago Dep. of Pl. and Dev., Landmarks Div. 2003. Archived from the original on July 30, 2012. Retrieved April 13, 2007. ^ "Union Stock Yard Gate". Chicago Dep. of Pl. and Dev., Landmarks Div. 2003. Archived from the original on July 19, 2012. Retrieved April 11, 2007. ^ "Old Stone Gate, Chicago Union Stockyards". National Park Service. Archived from the original on May 28, 2008. Retrieved April 12, 2007. ^ "Uptown Theater". Chicago Dep. of Pl. and Dev., Landmarks Div. 2003. Archived from the original on July 18, 2012. Retrieved April 13, 2007. ^ "Victory Monument". Chicago Dep. of Pl. and Dev., Landmarks Div. 2003. Archived from the original on June 13, 2008. Retrieved April 13, 2007. ^ "Villa District". Chicago Dep. of Pl. and Dev., Landmarks Div. 2003. Archived from the original on July 16, 2012. Retrieved April 13, 2007. ^ "Wabash Avenue YMCA". Chicago Dep. of Pl. and Dev., Landmarks Div. 2003. Archived from the original on July 16, 2012. Retrieved April 13, 2007. ^ "Waller Apartments". Chicago Dep. of Pl. and Dev., Landmarks Div. 2003. Archived from the original on July 19, 2012. Retrieved April 13, 2007. ^ "Walser House". Chicago Dep. of Pl. and Dev., Landmarks Div. 2003. Archived from the original on June 13, 2008. Retrieved April 13, 2007. ^ "James Ward Public School". Chicago Dep. of Pl. and Dev., Landmarks Div. 2005. Archived from the original on July 21, 2012. Retrieved April 13, 2007. ^ "Minutes of the Meeting: Commission on Chicago Landmarks" (PDF). Chicago Dep. of Housing and Economic Development, Landmarks Div. 2013. Archived from the original (PDF) on November 19, 2013. Retrieved October 23, 2013. ^ "Washington Block". Chicago Dep. of Pl. and Dev., Landmarks Div. 2003. Archived from the original on June 13, 2008. Retrieved April 13, 2007. ^ "Washington Park Court District". Chicago Dep. of Pl. and Dev., Landmarks Div. 2003. Archived from the original on July 19, 2012. Retrieved April 11, 2007. ^ a b c "Washington Square District and Extension". Chicago Dep. of Pl. and Dev., Landmarks Div. 2003. Archived from the original on July 17, 2012. Retrieved March 3, 2008. ^ "Washington Square District Extension, Isaac Maynard Row Houses". Chicago Dep. of Pl. and Dev., Landmarks Div. 2005. Archived from the original on July 17, 2012. Retrieved April 13, 2007. ^ "Ida B. Wells – Barnett House". Chicago Dep. of Pl. and Dev., Landmarks Div. 2003. Archived from the original on June 13, 2008. Retrieved April 13, 2007. ^ "Wells-Barnett, Ida B., House". National Park Service. Archived from the original on June 5, 2011. Retrieved April 16, 2007. ^ "West Town State Bank Building". Chicago Dep. of Pl. and Dev., Landmarks Div. 2003. Archived from the original on June 13, 2008. Retrieved April 13, 2007. ^ "Wheeler-Kohn House". Chicago Dep. of Pl. and Dev., Landmarks Div. 2003. Archived from the original on July 18, 2012. Retrieved April 13, 2007. ^ "Whistle Stop Inn". Chicago Dep. of Pl. and Dev., Landmarks Div. 2003. Archived from the original on July 17, 2012. Retrieved April 13, 2007. ^ "Wicker Park District". Chicago Dep. of Pl. and Dev., Landmarks Div. 2003. Archived from the original on July 15, 2012. Retrieved April 13, 2007. ^ "Wingert HouseWhistle Stop Inn". Chicago Dep. of Pl. and Dev., Landmarks Div. 2003. Archived from the original on July 18, 2012. Retrieved April 13, 2007. ^ "Woman's Athletic Club". Chicago Dep. of Pl. and Dev., Landmarks Div. 2003. Archived from the original on June 13, 2008. Retrieved April 13, 2007. ^ "Wood-Maxey-Boyd House". Chicago Dep. of Pl. and Dev., Landmarks Div. 2003. Archived from the original on July 19, 2012. Retrieved April 13, 2007. ^ "Wrigley Field". Chicago Dep. of Pl. and Dev., Landmarks Div. 2004. Archived from the original on July 18, 2012. Retrieved April 13, 2007. ^ "Yale Apartments". Chicago Dep. of Pl. and Dev., Landmarks Div. 2003. Archived from the original on June 13, 2008. Retrieved April 13, 2007. ^ "Yondorf Block and Hall". Chicago Dep. of Pl. and Dev., Landmarks Div. 2003. Archived from the original on July 30, 2012. Retrieved April 13, 2007. ^ Estimate of approximately 200 RHPs in Chicago not also designated as Chicago Landmarks derived as follows: There are 296 RHPs in Chicago, and there are approximately or exactly 107 sites identified in this article as being RHPs. That yields 296-107 = 189. As this list-article is an incomplete list of Chicago Landmarks, missing perhaps one or two dozen, it is possible that the number of RHPs not designated landmarks is somewhat lower than 189, but the total would still round to 200. ^ "Robert S. Abbott House". National Park Service. Archived from the original on January 3, 2008. Retrieved April 16, 2007. ^ "Adler Planetarium". National Park Service. Archived from the original on January 3, 2008. Retrieved April 16, 2007. ^ "Columbus Park". National Park Service. Archived from the original on January 3, 2008. Retrieved April 16, 2007. ^ "Compton, Arthur H., House". National Park Service. Archived from the original on February 12, 2012. Retrieved April 16, 2007. ^ "DePriest, Oscar Stanton, House". National Park Service. Archived from the original on March 3, 2008. Retrieved April 16, 2007. ^ "Du Sable, Jean Baptiste Point, Homesite". National Park Service. Archived from the original on November 23, 2007. Retrieved April 16, 2007. ^ "Lillie, Frank R., House". National Park Service. Archived from the original on January 3, 2008. Retrieved April 16, 2007. ^ "Millikan, Robert A., House". National Park Service. Archived from the original on March 3, 2008. Retrieved April 16, 2007. ^ "Orchestra Hall". National Park Service. Archived from the original on June 5, 2011. Retrieved April 16, 2007. ^ "Room 405, George Herbert Jones Laboratory". National Park Service. Retrieved April 16, 2007. ^ "Shedd Aquarium". National Park Service. Archived from the original on June 28, 2009. Retrieved April 16, 2007. ^ "U-505 (German Submarine)". National Park Service. Archived from the original on February 12, 2012. Retrieved April 16, 2007. ^ "Williams, Daniel Hale, House". National Park Service. Archived from the original on June 5, 2011. Retrieved April 16, 2007. 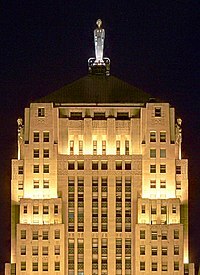 Wikimedia Commons has media related to Chicago Landmarks. This page was last edited on 8 April 2019, at 15:25 (UTC).